CONGRATULATIONS TO OUR MAY GIVEAWAY WINNERS! 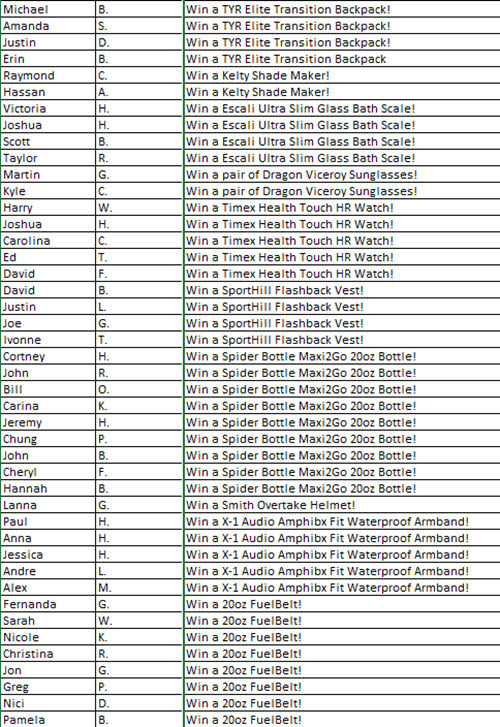 CONGRATULATIONS TO OUR APRIL GIVEAWAY WINNERS! 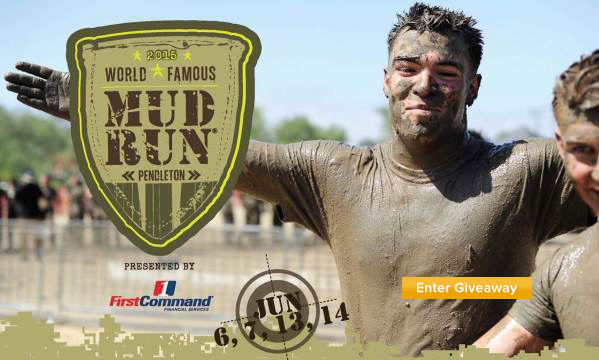 WANT TO WIN A WORLD FAMOUS MUD RUN ENTRY? YES, PLEASE! 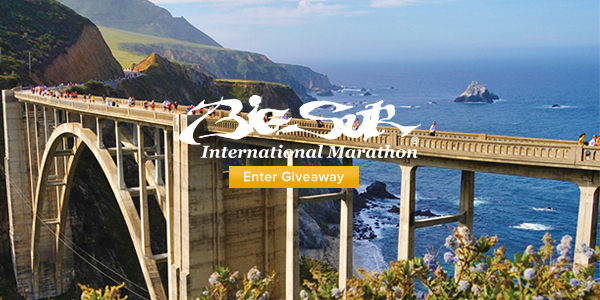 CONGRATS TO OUR BIG SUR MARATHON SWEEPSTAKES WINNERS! Be sure to enter the monthly giveaway contest to win prizes like these! Want to be a winner like Jane? Don't forget to enter to win our April gear giveaways! These 10 Advantage members get the chance to feel what it's like to be a marine for a day and challenge themselves to complete the mud run that sparked an entire industry! The World Famous Mud Run at Camp Pendleton is an experience you will never forget. Enjoy! Be world famous as the Camp Pendleton World Famous Mud Run® goes “Back to the Basics” in 2015 offering more HARD CORPS fun! There's over 20 obstacles ranging from steeple chase and cargo climb to sandbag overhead press and force protection barrier challenge. Be part of the event that inspired an industry! Come celebrate the history of the Marine Corps and create your own history during the event's 22nd year. These 10 Advantage members are this week's BIG winners because they are running in the Kentucky Derby Festival Marathon on April 25 for FREE! We hope you have an absolute blast! Stay tuned for more popular events in our Exclusive Access to Premier Events series. Coming up next: The World Famous Camp Pendleton Mud Run. This week's Exclusive Access to Premier Events sweepstakes is pure March Madness. Enter today to win a 1 of 10 FREE ENTRIES to the Kentucky Derby Festival Marathon! Even if you’re not selected, you can still register with an exclusive discount code for the full or half marathon. These 5 Advantage members must have 4 leaf clovers up their sleeves today because they won free entries to the Air Force Marathon on September 19th. Congrats guys. This event will be an awesome experience. We've got more popular races lined up for our Exclusive Access to Premier Events series. Coming soon: The World Famous Camp Pendleton Mud Run. In the 2nd installment in our Exclusive Access to Premier Events series we’re giving 5 Advantage members the chance to participate in one of the "top 15 marathons in the US". It is going to sell out so take advantage of this exclusive opportunity. Marathon, Half Marathon, 10k, and 5k distances are available. 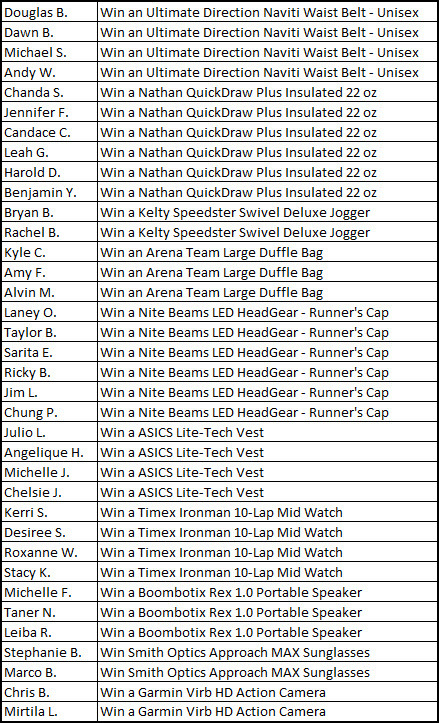 These 10 lucky Advantage members will be participating in the SOLD OUT Big Sur International Marathon on April 26th. We hope you have an amazing time! Stay tuned for our next event in the Exclusive Access to Premier Events series: The Air Force Marathon! We’re giving 10 Advantage members the chance to participate in a race they will never forget. Winners can pick their distance (Marathon, 21 Miler, 10.6 Miler, 9 Miler, or 5k) so it’s an event everyone can enjoy. 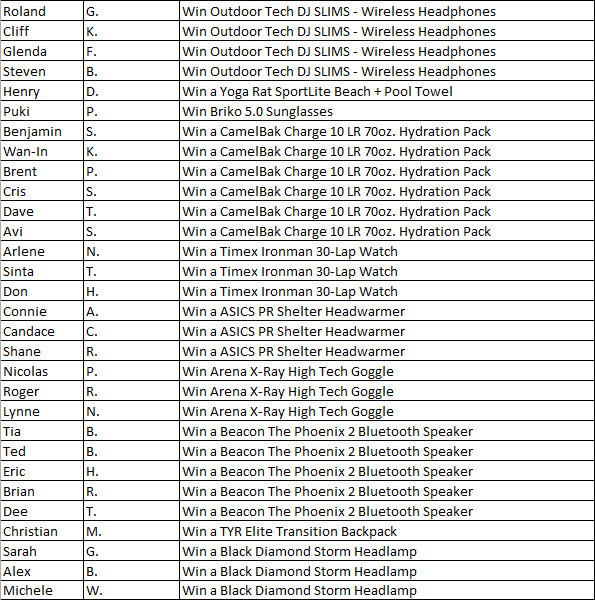 CONGRATULATIONS TO OUR DECEMBER MONTHLY GIVEAWAY WINNERS! Happy Holidays from all of us at ACTIVE Advantage. Our gift to you is 30% off everything on GearUp from running shoes to surf boards. Now's the time to treat yourself to a few of your favorite things. Check your email for coupon code. Merry Christmas! Love trail running? Today's VIP deal will help you save on one of the top all-terrain shoe brands around. Inov-8's footwear allows runners to adapt to their environment in order to handle any terrain or obstacle. Check your email for coupon code. Hit the trails! Dozens of popular magazines are at your fingertips. Get a year subscription to America's top-selling magazines at amazing low prices! Whether you love sports, fitness, cooking, or pop culture, we have just the titles for you. After the first year, the subscription will auto renew at the current rate. If you don't want your subscription(s) to continue feel free to cancel any time. Pick your favorites today! Tell us your story to be entered to win a $750 prize package that includes $250 in rebates towards any ACTIVE.com or ReserveAmerica.com reservation, a $250 GearUp.ACTIVE.com shopping credit, and a $250 Chevron/Texaco gas card. This week's holiday deal brings another awesome shoe brand. Altra's innovative shoe design promotes low-impact technique and allows your feet to remain in a natural, relaxed position across every terrain. Save 30% on Altra shoes for the next week. Check your email for coupon code. Happy running! Just because Cyber Monday passed doesn't mean the amazing deals will slow down. Holiday deal #6 is our best yet! Advantage members can save an extra 30% on ALL GearUp products until midnight on Wednesday. Grab your favorite gear before it's too late! Check your email for coupon code. Get geared up! There will be 92 giveaway winners selected tomorrow. Enter today to win yourself a gift for the holidays. Holiday deal #5 has arrived. You've got access to a VIP 30% off code for one of GearUp's newest and hottest brands, Pearl Izumi. Pearl Izumi’s cycling line combines over 60 years of dedication to producing the highest performing cycling apparel on the planet. Experience the quality yourself. Check your email for coupon code. Happy Shopping! Need a wetsuit upgrade? The offseason can be the best time to get quality gear at a deep discount. Pick your favorite triathlon wetsuit from Orca, 2XU and XTERRA. When you combine your 30% off coupon with GearUp's awesome pricing you'll be thrilled you got your suit before next season rolls around. Check your email for coupon code. Happy Holidays! Looking for the perfect outdoorsy gift for that special someone (or just something nice for yourself)? Find it on Coleman.com and use your exclusive Advantage member coupon code on the cart page at checkout to get 30% off your purchase! Check your email for coupon code. Enjoy! It’s time for our 2nd annual GearUp Shopping Spree! Share what's on your gear wish list and you'll be entered to win a $500 shopping spree on GearUp. Tell us what you want and we’ll listen. Following last year’s contest we added popular brands like Mizuno and GoPro. Your wish list items can be anything from running shoes to your favorite swim goggle brand. Think outside the box and we’ll do our best to make your dreams come true. We'll be picking 8 winners on October 1st. Good luck! We're giving away FREE ENTRIES to 13 Run or Dye events from Hawaii to Vermont on Tuesday, August 26th at 6:00 PM ET. The first 65 members to claim the entries will win, so be sure to mark your calendars! Do you want to go to a professional or college sports game this year and cheer on your team? 'Canada's Coolest Summer Camp' is offering Advantage members a chance to win a free summer day camp! The first two members to claim the deal when it goes live June 12, 2014 at 12:00pm EST will get to send their 7-17 year old to any Camp Ecolart Day Camp this summer! 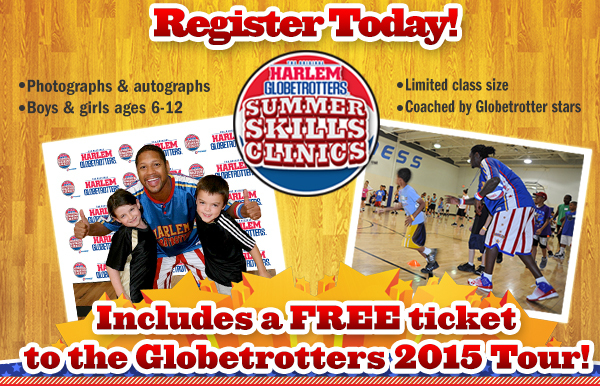 We are excited to announce a new member-only opportunity to receive one of 5 complimentary entries to the Harlem Globetrotters Summer Clinics, or get $15 off your clinic registration when you sign up by March 10th. Be one of the first 5 members to claim an entry when the deal goes live on February 18, 2014 at 12:00pm EST! Race season can be expensive so we’re thrilled to launch a new ACTIVE Advantage benefit that will help you be more active without putting a dent in your wallet. Simply register for 5 events on ACTIVE.com in a 12 month period and we’ll reimburse you up to $65 for your 5th one*. You can easily cover your entire membership cost on a single race. (Not to mention all the other cool stuff you save on). Check out the benefit details to see how you can earn a free race in 2014. We're excited to announce an all new membership benefit. ACTIVE Advantage members now get FREE and unlimited access to over 50,000 trail profiles, National Geographic maps, and advanced planning tools through AllTrails Pro. 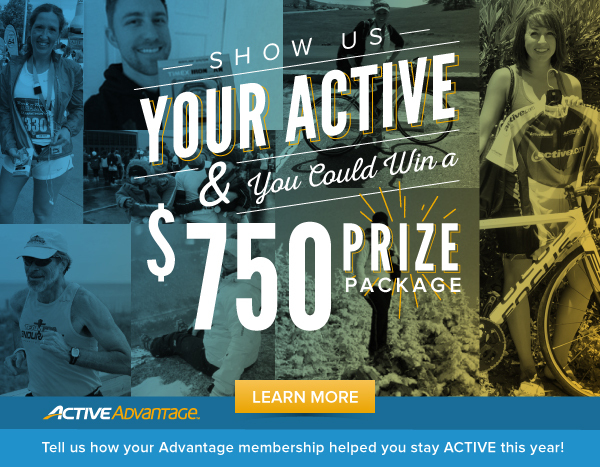 Regularly $50/year, it's now available to you and your family at no-cost as part of ACTIVE Advantage! All of us on the ACTIVE Advantage team would like to thank our members for helping us raise funds for the KIDS in the GAME charity. Thanks to your help, we are thrilled to be donating $5,460 to this great cause. As a company, ACTIVE network will be donating $76,380 in total. So far these funds have been used to give 862 underprivileged children the ability to participate in a season of youth sports and experience the joy of playing and being active. That equals 19,483 hours of physical activity for kids from San Diego to Philadelphia and many places in between. The VIP deal grand finale has arrived: save an extra 25% on every item on GearUp. From running shoes and compression socks to camping tents and bicycles, there’s something for everyone to enjoy (code expires 12/30). Check your email for coupon code. 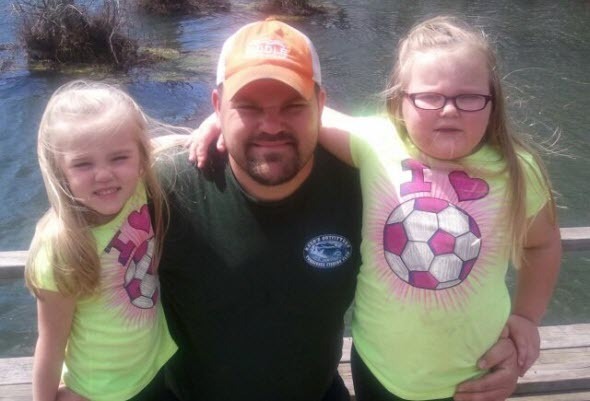 Chad P. and his family enjoyed a Mississippi State Park pass, as one of the 205 Federal and State Park pass Advantage winners this year. "Thanks for the free Mississippi State Park pass. My family and I really enjoyed visiting Wall Doxey State Park." Keep checking back here for new sweepstakes throughout the year! 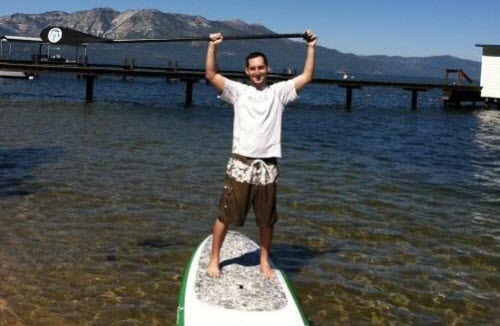 Back in September, Gino A. from Tempe, AZ won the Advantage Dream Road Trip Sweepstakes. Want to be the next lucky winner? Check back for new sweepstakes throughout the year! We want to help you SAVE on your holiday gifts (for yourself or others) this season and also GearUp for a New Year. This is why we decided to run the GearUp to New Year's Sweepstakes where five ACTIVE Advantage members will WIN $1,000 in GearUp shopping credits. Click here and follow the two simple login steps to ENTER! Sweepstakes closes 1/1/14 so get in on the deals while you can! We know that holiday travels can be expensive, so we've decided to give away $25 Chevron/Texaco gas gift cards to members to help with those costs. 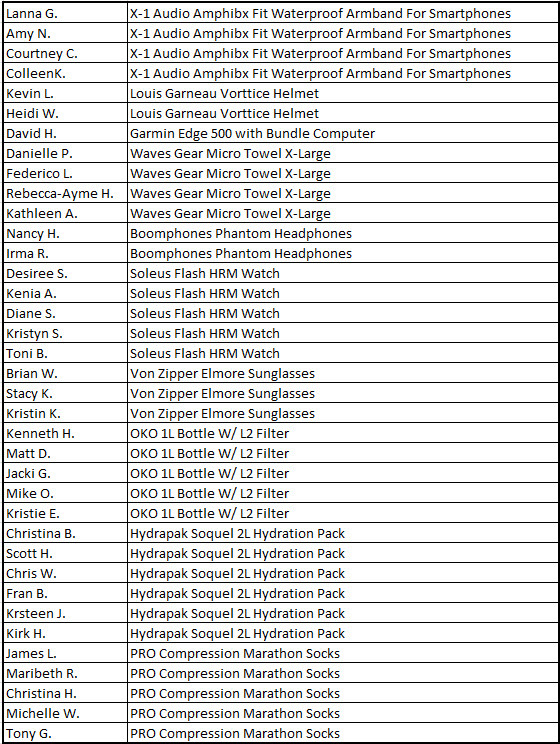 Enter by 12/5/13 for your chance to be one of our twenty winners. Help Get Kids In The Game! Yup. It's simple as that. Just forward your ACTIVE.com registration or ReserveAmerica.com reservation confirmation email to ActiveCharity@Active.com and ACTIVE will make a $10 donation on your behalf! In July, Advantage sponsored three lucky sports team to help with the purchase of team gear, travel expenses, game snacks, participant registrations, player scholarships, end of the season parties, or anything else the teams needed this year. 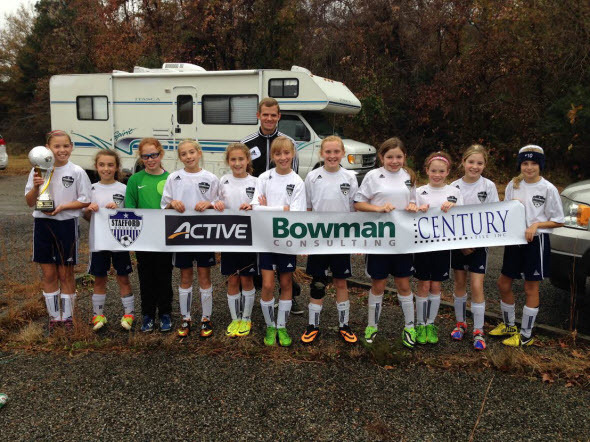 The East Allen Township Soccer program was one of the winners! 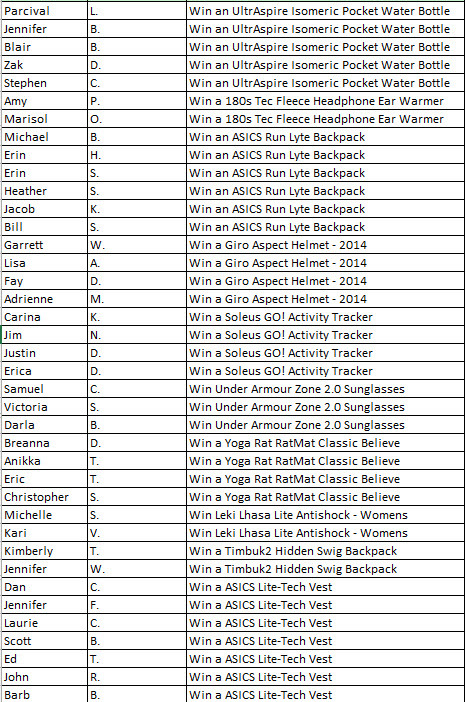 Each month we give away over 90 prizes including a bike, sunglasses, gift cards and more. Enter the August Giveaways today and you can win gear for your next active adventure! Click here to enter. For a limited time get 40% off your entire purchase at SkirtSports.com. Use code ActiveSept13. Offer expires 10/9/13. Happy Shopping! Click here to order. Have you ever wanted to take a road trip for a week but thought it'd be too expensive? Well, you're in luck! Simply tell us what your dream road trip would look like -where would you go, what would you see, who would you go with, etc., and you could be selected as our lucky winner. Don't wait! Enter by 9/12/13 for your chance to get a free 7 day motorhome vacation from El Monte RV.Click here. The Color Run is giving away 35 entries. Get yours today! 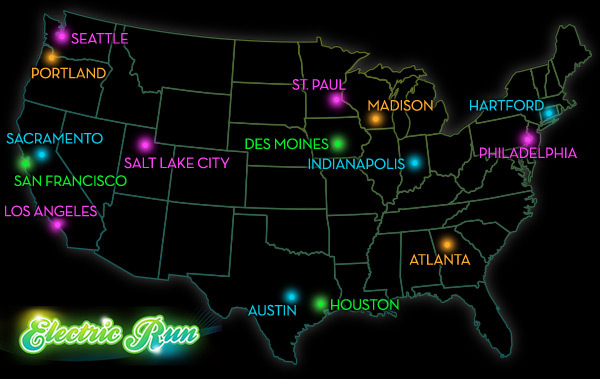 The Color Run™ is giving away FREE ENTRIES to 7 events across the country on Tuesday, August 13th at 3:00pm PT. The first 35 members to claim the entries will win, so be sure to mark your calendars! Click here to order. Road ID is the premier line of identification gear for active people like you. In an accident, it will be your lifeline to proper medical treatment and immediate contact of family. Road ID is sleek, durable, comfortable and lightweight - it could even save your life. For a limited time, get 20% OFF your entire purchase at RoadID.com. Go Shopping! Check your email for the coupon code. Click here to order. ACTIVE Advantage is excited to announce a NEW membership benefit that makes it cheaper and easier for you to get your best race-day photos. Simply order your photos from an event and we'll reimburse you up to $15 twice a year! Click here to learn more. Share where you watched the 4th of July fireworks and you'll be entered to WIN a Big Agnes Mountain Wolf 4 person tent! Click here to enter sweepstakes by 07/31/2013 for your chance to be our lucky winner. Find out what it truly means to have the ACTIVE Advantage. Tell us about your sports team (that you or your child plays on, or that you coach) and why you think you should get the ACTIVE Advantage sponsorship, and you could be selected as one of our 3 winners! Enter by July 14, 2013 for your team's chance to get up to $1,500 cash to use any way your team chooses. Enter Contest. You can win a $500 shopping spree on GearUp! Share what's on your gear wish list today and you'll be entered to win a $500 shopping spree on GearUp! We'll be picking 3 winners on July 1st.Click here. GET 10% OFF SUMMER HOCKEY CAMPS! We are excited to announce a new and limited time member-only discount of 10% off Pro Ambitions Hockey camps for your youngster(s)! 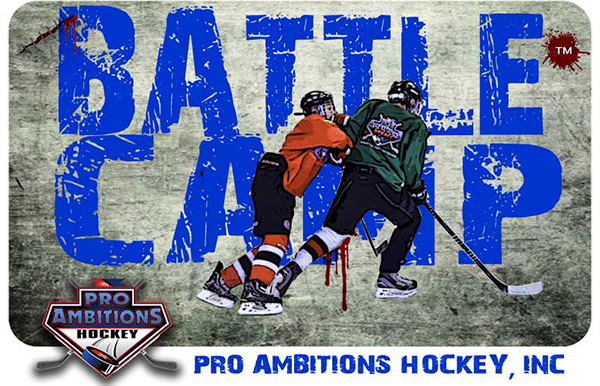 This summer, Pro Ambitions is bringing their staff of hockey experts to 40 states and 150 different locations for a week of battle and goalie camps for kids ages 6-14 years old. With a ratio of 5:1 campers to coaches, and over 37 hours of hockey specific training, no other camp will prepare your young player for the fall season like Pro Ambitions, the #1 hockey camp in North America. Click here to check out camp dates and find a location near you! Sign up before July 1, 2013 to receive your 10% discount. Check your email for the coupon code! ENTER THE MEMORIAL DAY SWEEPSTAKES! Feeling patriotic? Explore more of our beautiful country by visiting a State Park, National Park, or Federal Recreation Lands! Enter the Advantage Sweepstakes by 06/09/13 and you could be one of the 55 lucky Advantage members to WIN an ANNUAL PASS for FREE entry into participating National Parks and Federal Recreation Lands or CA, MS, or VA State Parks. Enter Sweepstakes. Good luck and happy Memorial Day! We're excited to announce an all new membership benefit that will allow ACTIVE Advantage members to automatically SAVE $10 on every California State Park campground reservation made through ReserveAmerica.com! Simply sign in to ReserveAmerica.com with the email address and password tied to your ACTIVE Advantage account to book your campsites and receive your member-only discount at checkout. Want to make sure your kids have enough activities to do this summer but don't want to spend a fortune? If so, then you're in luck! We're giving our Advantage members the chance to send their kids to camp for FREE (up to $500)! Any day or overnight camp registration you make through ACTIVE.com as an Advantage member this year counts. Enter sweepstakes by 05/31/2013 for your chance to be one of the 3 winners. Celebrate this Cinco de Mayo with $5 off your event registrations! Rose has been an ACTIVE Advantage member since September 2011 and couldn’t be happier. She renewed her membership this past year and has saved $309.64 on gear and events along the way. The best part is her savings have only begun. With free training plans, gear discounts, and travel deals also available this year, Rose can save even more! In the wake of yesterday’s tragedy at the Boston Marathon, we wanted to send a message of solidarity and support to the running community and all Bostonians. We are proud to be part of the endurance community; and are humbled by the strength of spirit shown by the organizers of the marathon, the runners participating in it, the first responders, and the thousands of spectators involved. They are our inspiration. Boston, our thoughts are with you. FREE REGISTRATION SWEEPSTAKES WINNER SPOTLIGHT: RICHARD V.
In January we gave 5 Advantage members FREE event registrations and campground reservations for an entire year. Richard was one of our lucky winners and has already participated in 6 events for free. 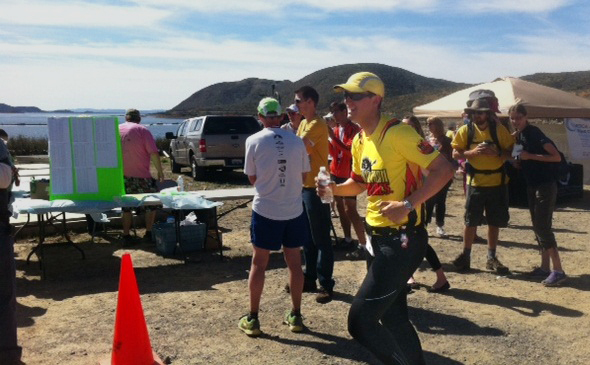 Here is an update from his experience at the Diamond Valley Lake Marathon. WHERE'S YOUR FAVORITE CAMPING SPOT? 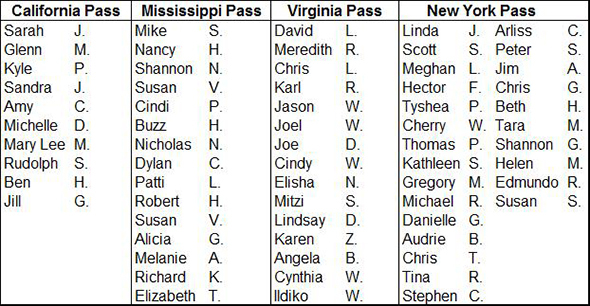 CONGRATULATIONS TO OUR 65 STATE PARK PASS SWEEPSTAKES WINNERS! GOOD LUCK TO THE 75 ELECTRIC RUN WINNERS! THE EVENT IS A BLAST. HAVE FUN! HOW TO MAKE BACK THE COST OF YOUR ADVANTAGE MEMBERSHIP + MORE! ENTER THE ST. PATTY’S DAY SWEEPSTAKES! We’re giving away annual State Park passes to Advantage members and YOU could be one of our 65 lucky winners. Simply click here to enter by 03/31/2013 for the chance to win an annual State Park pass to one of four great states: California, Mississippi, New York, OR Virginia. Winners will enjoy free and unlimited entry for a whole year! WELCOME TO THE ADVANTAGE BLOG! Hi there and welcome to the first ever ACTIVE Advantage Blog! We are very excited to have a way to better engage with you and keep you in the loop on new promotions, sweepstakes, special offers, great articles, and more. In a nutshell, our goal is to provide you with useful posts on how to SAVE money and be more ACTIVE! We also want to hear from YOU so don’t be shy to email us anything you’d like to share –links, pictures, videos, personal stories, etc. Join the ACTIVE Advantage premium membership for deals that make it cheaper and easier for you to pursue the activities you love, no matter what your passions are.